My most popular article by far is 50 Survival Items You Forgot To Buy. 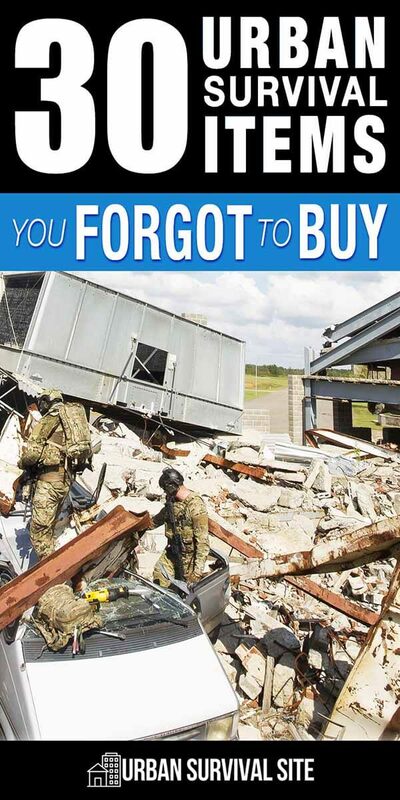 The list is interesting to both newbie preppers and experienced preppers because both groups usually find at least a few items they overlooked. Since this site is mainly focused on urban survival, I realized I should make another list, this time of urban survival items. Chances are, you’ll see several items below that you forgot to get. If so, leave a comment and tell me about it, or tell me which items I forgot to include. Survivalists often stock up on many battery-powered products such as flashlights, lanterns, radios, and more, but then forget to keep a supply of extra batteries around in case the batteries in those products go dead. Take stock of the different kinds of batteries that you will need, and make sure you have plenty of them around. There are plenty of scenarios where a bike may be your best means of transportation in a disaster, from stealth scenarios where you don’t want to draw too much attention to a scenario where an EMP has rendered cars inoperable. In order to rely on your bike, though, you’ll want to have the right gear such as an air pump, a bicycle bag, and a light. Bolt cutters are an urban survival necessity, as they allow you to get past any padlock or fence that might be standing in your way. Just be sure to buy a pair of bolt cutters big enough for the job. Having a source of entertainment during a disaster is really undervalued. Many preppers keep a collection of books that they can read to keep their mind occupied during tough times, but you will also need to invest in a book light so that you can continue reading even if electricity isn’t available. Whether you want to camouflage a structure you build or make an item less reflective, black spray paint is a great product for reducing the visibility of items in a wide range of situations. Keep a few cans of it around and you’ll have a much easier time keeping things hidden. A quality crow bar could come in handy in a wide range of scenarios during an urban disaster. This age-old tool is definitely something you want to have. The versatility of duct tape is well-renowned, however, the important role that it plays as part of a person’s disaster supplies is often overlooked. Given how many different things duct tape can be used for, the more of it you have around the better. There’s often no shortage of dusty old buildings you will have to enter during an urban disaster. To protect yourself from this dust and the health problems it can cause, be sure to invest in some dust masks. Your hearing is one of the most important senses you have, so be sure to protect it when entering high noise-level situations with a set of ear plugs. If you are traveling in a group, you’ll want to have a way to quickly signal the rest of your group in an emergency. Shouting alone won’t cut it, as there’s likely to be a lot of people shouting during an urban disaster. Instead, carry an emergency whistle with you so that you’ll be able to pierce through the chaos should you ever need to. During an urban disaster, fires are all too common and can present a real danger to you and your supplies. Make sure you’re prepared to deal with fires by investing in a fire extinguisher. There are plenty of scenarios where you may need to quickly shut off the gas in a building, and doing it by hand may not be a possibility. Instead, you’ll want to have a gas shut off wrench available in order to get the leverage you need to fully close the valve in a timely manner. Siphoning gas from abandoned vehicles is an excellent strategy for gathering extra gas during an urban disaster. However, siphoning gas using your mouth is more difficult than the movies make it out to be. Instead, invest in a gas siphon pump to ensure you can quickly siphon gas without making yourself sick in the process. Whether you are repurposing a piece of metal you’ve acquired, fixing your plumbing, or you are needing to get past a metal lock, having a hacksaw available can often be extremely useful in an urban survival scenario. Most survivalists will have plenty of flashlights in storage. However, the usefulness of a headlamp is often overlooked. There are plenty of situations where you will need a light source and both of your hands free at the same time. In these situations, a quality headlamp can be incredibly valuable. Staying warm in the winter when the power is out can be a real challenge, especially in urban areas where you likely won’t have a woodstove in your home. Kerosene heaters are great for providing you with a source of warmth that is not dependent on electricity. Of course, you will also want to make sure you have a supply of kerosene to fuel it with as well. GPS won’t do you much good if the power grid or cellphone towers go down. Instead, you will have to rely on old-school navigation tactics to find your way around your area. Whatever area you may live in or whatever area you foresee yourself traveling to after a disaster, be sure to purchase some local maps of the area. Not every lock can be cut through with bolt cutters. In fact, for most locks other than padlocks, you will need a lockpick set to get past them. Buy a quality set and learn how to use it ahead of time. For many tasks such as electrical work, needle nose pliers are invaluable. They are arguably the most versatile and useful type of pliers, and you will definitely want to have a pair available. For DIY repairs and projects, paracord is one of the most useful materials available. This tough cord is easy to work with, easy to store, and incredibly strong, making it a must-have for urban survivalists. From creating makeshift shelters to protecting your vital supplies from the elements, there’s just about no limit to the number of ways that plastic sheeting can come in handy during a disaster, and you’ll want to make sure you have plenty of it available. In the same way that you need to protect your hearing with a set of earplugs, you’ll want to protect your eyesight with safety goggles. From flying projectiles to harsh fumes, safety goggles can keep your eyes safe in a wide range of scenarios. From first aid to building projects, a pair of scissors often has a wide range of uses in a survival situation. In fact, you may wish to buy multiples pairs of scissors for various uses and in case one breaks. Super glue is another incredibly versatile product that can be used in a survival scenario for everything from making makeshift repairs to closing up a cut, among other things. If you don’t want to go without electricity, you will need a way to continue generating electricity even after the power has gone out. One way to do this is with solar panels. Today, quality solar panels are much more affordable than you might imagine, making them an excellent option to consider. It’s hard to know what small tools you will end up needing in a survival scenario. With a Swiss army knife, though, you have access to a wide range of small tools in one convenient product. Tarps have a wide range of uses, from protecting plants from frost to covering broken windows to creating a makeshift shelter. Given their versatility, you should certainly have a few tarps around as part of your disaster-preparedness supplies. If you don’t have electricity available, one of the many things you are likely to miss is the ability to tell what time it is. To keep track of the time even when the power is out, invest in a few wind-up clocks. Surviving a disaster scenario will likely require a lot of hands-on work. Without a good pair of work gloves, though, this hands-on work will likely lead to blisters, cuts, scrapes, and all sorts of other damage to your hands. Set aside a good pair of work gloves so that you will have them available should disaster strike. Few items are more useful for DIY repairs than zip ties. Like duct tape and superglue, zip ties are definitely something you will want to have in your toolbox for quick repairs and makeshift building projects as they have many uses.